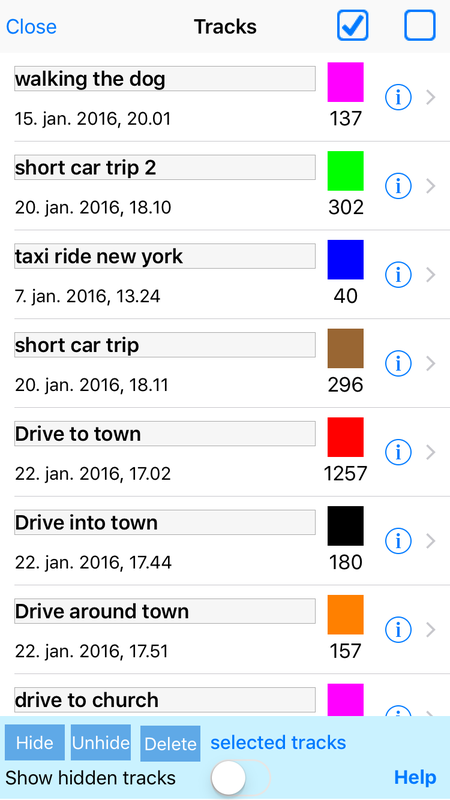 The bbTracker is an easy to use application for recording positions on your iOS device (all iPhones and iPads). Recording is started by simply pressing the record button, and the recorded positions will be stored in a track. 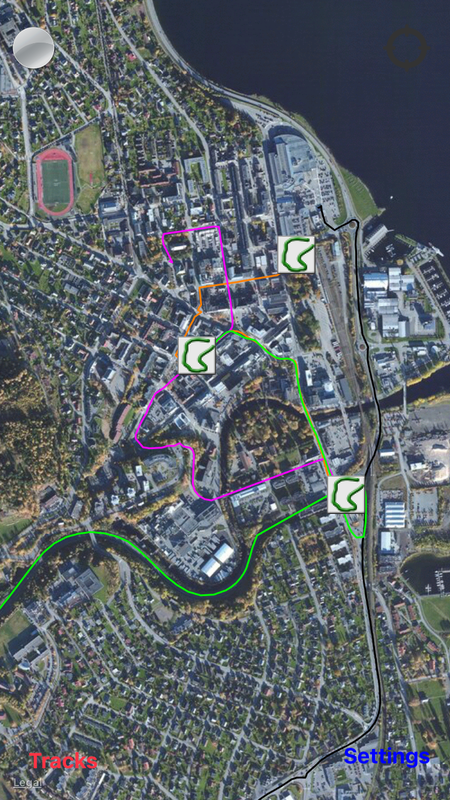 Multiple tracks can be recorded and shown on the same map, and various functionality may be performed on them including labeling, hiding, deleting and displaying details like speed/altitude curves and statistics. Store tracks to keep record of your travels, training schedule, where you have been walking, driving etc. Show others the best route to get to your house, a restaurant, the airport etc. Record tracks to ease finding your way back to your car, hotel etc. in for example unfamiliar areas, large cities and large parking lots. Maps and satellite images provided by Apple map services. For support please email iosapp@daeco.no. Adjust frequency of recorded positions to fit the speed of movement and device capacity. Map support all normal map operations like zoom, pan, rotate and follow user. The app will use the network position if GPS is not available, but this position will be inaccurate. At startup the app will connect to the internet, download the map for the current location and zoom in to it. All previously recorded tracks will be loaded and displayed on the map. It is possible to set a "hide" flag on individual tracks to avoid them being displayed. The main window shows a map containing all previously recorded tracks , the current user position and the current track as it is being recorded . 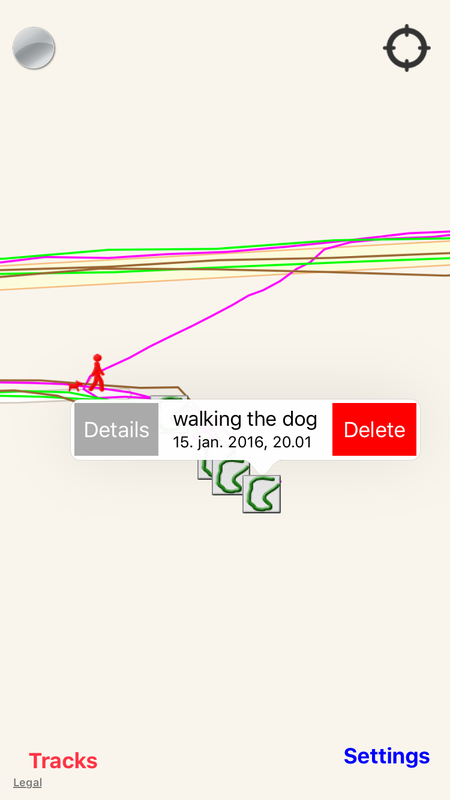 Standard map functionality for zooming and panning is available by dragging, pinching etc. Focus map on current user location by pressing the icon in the top-right of the window. The current location will at any time be marked. By default the bbTracker logo is used, but this can be changed in the app settings (see below). To start recording a track, press the recording button in the top-left corner . When the recording starts, the button will change to . To stop the recording and end the track, press again. Note that tracks with less than 2 points will not be stored. As soon as the recording starts, a new track icon will appear at current location, and a track will start building up. Positions are recorded as often as specified by the "Position Interval" setting (see below). The track icon / will always be placed at the first position on the track. If positions are being recorded ( is on), the recording will continue to run even if the app is closed (for example if Home button pressed). This allows the user to use the iOS device for other tasks even if bbTracker is working. Note that the operating system on the iPhone/iPad may decide to (temporarily or permanently) stop the background recording task if the device is under heavy load, for example while running games. It is therefore recommended not to use the device for very heavy tasks while recording is running. A notification will be put into the notification list when bbTracker enters the background, and the bbTracker icon will display a badge number indicating the application is running in the background. Stopping the recording will remove the notification and allow the app to terminate if it is closed. Note that the track recording will continue until it is canceled by the user! If left running it may fill the storage and drain the battery. It is therefore highly recommended to enable notifications for bbTracker to make it possible to detect if the app is running unintentionally in the background and therefore avoid unnecessary battery drain! Tapping the track icon in the main view will bring up a popup view showing the track name and date, and buttons to show more details and delete the track. 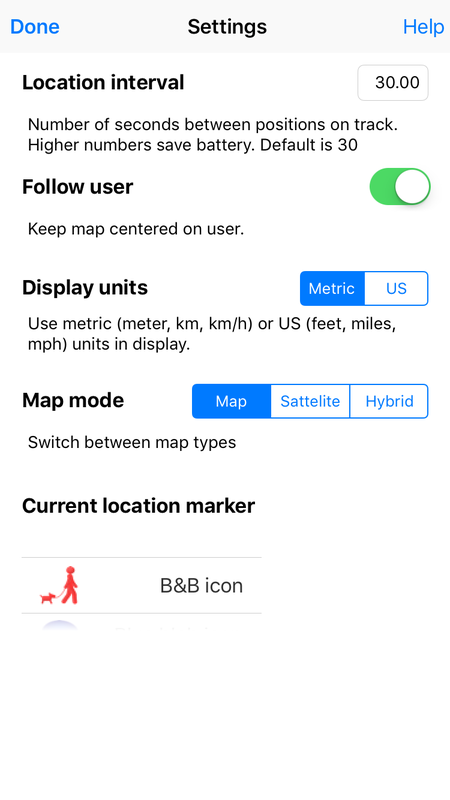 Switch between metric and US units in the settings view to display values in meters/km/h or ft/mph. Track name. Tap on the name to bring up a dialog where you can modify the name. Tracks without names lists <unnamed> as name. Just tap anywhere on the details view to close it. It may be useful to give a track a name. By default the track will be labeled with just the time and date of creation with <unnamed> listed as name. Tap on the track icon , and press the track name in the popup that appears for a minimum of one second.. In the Details window, tap the track name at the top of the window. From the track list window, tap on the name of the track. See "Track list window" section below for more info. Performing any of the tasks above will bring up a dialog where a new name can be specified. The app settings window is opened by tapping "Settings" in the main window. Position interval: The distance in time between stored positions on a track. The default is to record a position every 30 seconds. Adjusting this value will change the amount of data stored for each track. If you experience your device being slow or fill up with data increasing this value may help the app run faster. If the tracks are very coarse because you are moving fast during recording (for example by using a car), you may want to reduce it from the default 30 seconds to for example a position every 3 seconds. Follow user: Keep map centered on current user location. Useful when recording a new track, but should be turned off when moving around on the map and looking at old recorded tracks. Map: Typical road map. Roads, some man-made features, and important natural features such as rivers are shown. Road and feature labels are also visible. Satellite: Satellite photograph data. Road and feature labels are not visible. Hybrid: Satellite photograph data. Road and feature labels are visible. Tap on the Done button to go back to the map. Each row shows one track, including its name, time of recording, color of track and number of positions on the track. The row is grayed and "Hidden" is shown across the row if the track is hidden (and "Show hidden tracks" is selected). An info button (i) is shown at the end of the row allowing display of more details on the track. 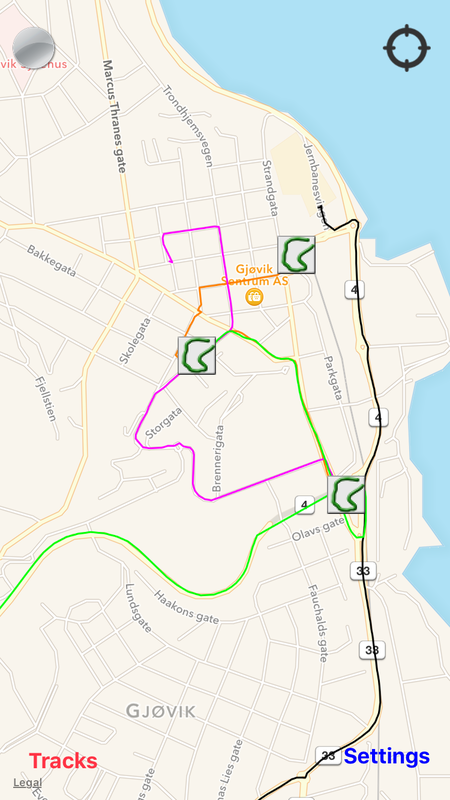 Keep your finger pressed ons a track row for a minimum of 2 seconds, and the app will close the track list and zoom to the selected track on the map. Note: This will also set the follow user setting to off. Tap on the row (outside the track name) to select and perform tasks on selected tracks. The two buttons at top left allows selection and deselection of all tracks in the list. Tap on the track name to open a dialog and type in a new name. <unnamed> will be shown if the track has not yet been given a name. At the bottom of the window is a toolbar with functionality to perform on the tracks in the list. Hide Hide selected or all tracks. It may be desirable to hide some tracks - to avoid clutter on the screen or to make the map more responsive. Delete Delete selected or all tracks. Delete tracks will bring up a confirmation dialog. Deleting tracks can not be undone. selected tracks Tap to switch to all tracks mode. When selected tracks is shown the Hide/Unhide/Delete buttons applies to only selected tracks. all tracks Tap to switch to selected tracks mode. When all tracks is shown the Hide/Unhide/Delete buttons applies to all tracks. Show hidden tracks Switch to show hidden flags in the track list. Default is to not show hidden tracks. Help Open browser and show help text (this page). Tap on the Close butto at the top of the window to go back to the map. The app implements several tricks to reduce battery consumption and memory/disk usage. On iOS 9.0+ the system navigation hardware/software must be continuously running also when the app is in the background. This leads to higher than normal battery consumption when bbTracker is active, but recording can continue in the background for several hours without draining the battery on a normal device. It is however recommended to connect the device to a charger if used with high storage rate (short time between positions) for example when recording in a car and/or the app in the foreground. Keeping the app in the foreground with map displayed consumes a lot of battery. 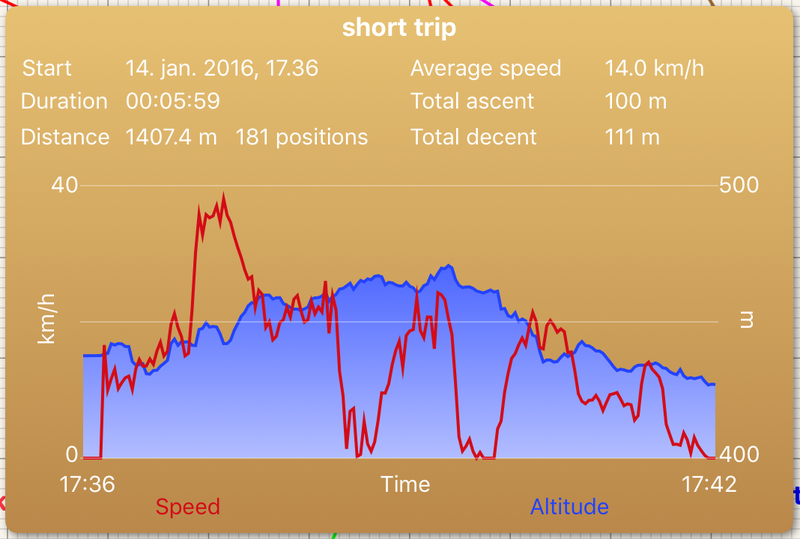 GPS height accuracy is normally pretty poor, so the numbers for altitude and total ascent/descent will normally be inaccurate. bbTracker applies a filter to the altitude measurements to remove noise and make the graph smoother, but the values may still be a bit off. Speed calculation is based on location positions and the distance between them. Due to the way iOS delays delivery of positions when the device is stationary until the device "has moved significantly" the first positions after a stop may appear to be a long leap. This causes a spike in speed after a stop which is very visible for example when recording positions in a car driving through a city doing lots of starts/stops at road crossings etc. bbTracker runs an adaptive filter to reduce the effect, but it is still there to some degree. Recording tracks will write data to the device storage, which may eventually fill it up. The amount of storage varies a lot from device to device, but it may become necessary to delete some tracks if it runs full. Try hiding some tracks. This will not reduce the storage/memory usage, but will reduce the amount of tracks drawn on screen which may speed up the app. Try deleting some tracks. This will reduce the storage/memory usage. Try deleting all tracks. This will delete all tracks, including hidden, and perform a wipe of the track directory. This will reduce the storage/memory usage. Try reducing the amount of data recorded by increasing the distance between positions. This is done by adjusting the "Interval between positions" setting. By default a position is recorded every 30 seconds (which produces data at a low rate). We are always trying to improve our products. For feedback on bbTracker (bug reports, requests for improvements and new functionality, complaints and praise) please send an email to iosapp@daeco.no.